The Teskey Brothers are an Australian band from Melbourne, featuring Josh Teskey, Sam Teskey, Brendon Love and Liam Gough. They released their debut album, "Half Mile Harvest" in 2017. 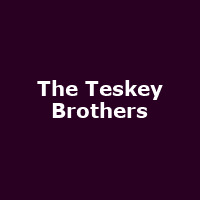 "The Teskey Brothers are a rare musical gem. Honouring that old school Motown sound and working it into something of their very own, the band have received widespread acclaim for their gorgeous debut album Half Mile Harvest."